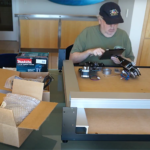 MIT Students Create Hand-Held CNC Router: You Gotta See This! Every now and then you see one of those inventions or products that makes you do a total double take because you realize they are game changers. 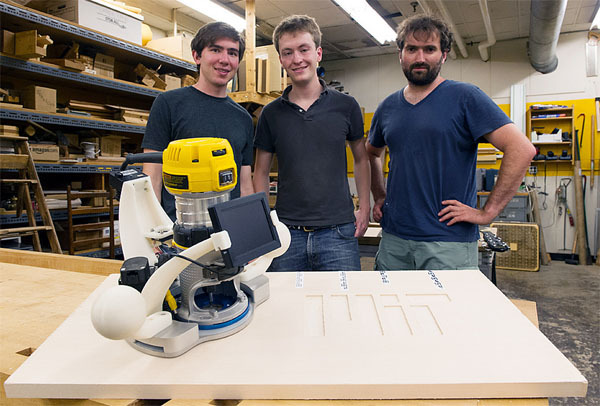 Three MIT students, Ilan E. Moyer, Alec Rivers, Frédo Durand (left to right in the picture), have created a game changer for CNC Routing and woodworking. 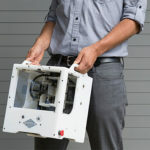 Their invention takes a handheld router and converts it into a precision CNC machine that can still be handheld. It does this using a combination of digital camera vision and servo-controlling the precise position of the bit. 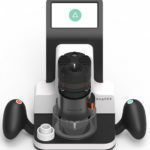 Think of it as the CNC version of image stabilized cameras. If you have a sensor that can tell which direction a camera is vibrating it can be used to control a mirror that counteracts the vibration, keeping a steady image. In this case, the camera is used to film a pattern on the wood or other material. A cutting path is super-imposed on that. The operator sees the path on the wood on the little screen. They grab the handles and guide the router along the path by watching the little screen. As you can imagine, for most people, tracking a path like that is hard, and they’ll make mistakes. That’s where the servos come in. The servos move the router bit around just enough to keep it exactly on track. Genius! You get a pretty clear idea of how it works, and the test was certainly a torture test: cutting out a map of the United States. Lots of irregular edges but a clearly defined shape that had to be tracked well to be recognizable. The router did a great job and made it relatively easy for the operator. – To make the tool work, two problems had to be solved. “Localization” enables the tool to know where it is to a high enough degree of accuracy. 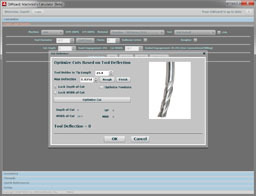 “Actuation” allows the tool to move the bit with enough precision that it tracks where it is supposed to be. – When cutting a material that doesn’t have enough “grain” so the camera can tell where it is, they simply attach tape that has some symbols on it so the camera can get its bearings. You can see such tape on the demo video and picture above. – They mention the concept is not limited to routers, and discuss vinyl sign cutters as one possibility. My first thought after seeing it was to use it to lay down pinstripes on hot rods, LOL. 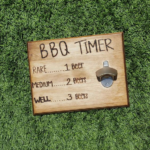 That takes such a steady hand, but a tool like this could do it with ease. 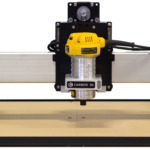 This type of technology should make it far cheaper to deliver CNC routing capabilities. It will be interesting to watch it unfold. Shaper Tools: What If Hand Tools Were CNC? This is incredible! As a woodwork as much or more so than a metal worker this could be a huge game changer. It don’t know how difficult it is to get the layout onto the substrate to be machined but if it an be done with relative ease and can handle straight lines well this could vastly change the world of cabinet making. Frankly I hope DeWalt, Milwaukee or one of the other big tool makers is all over this. If not I hope that some venture capital is coming their way.